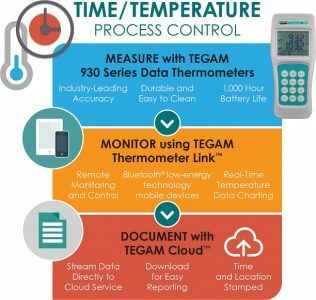 What is Best for Your Temperature Measurement Application? Each method has its own set of strengths and weaknesses. Contact Measurement is usually used to measure surface, interior or immersion temperatures. Touching, being inserted into, or submerged in a substance usually will give you the most reliable readings. You can see where and what you are measuring. For food processors and handlers, HACCP and the FSMA have brought about an unprecedented emphasis on process data collection, record retention, and data reporting. These new challenges require new solutions that address the need for data collection and integrity without disrupting existing food handling processes. On January 13, 2017, the FDA released updated draft guidance for the food industry detailing its recommendations for controlling Listeria monocytogenes (“Listeria”) contamination in ready-to-eat (“RTE”) food products. The draft guidance provides food processing facilities a framework for minimizing Listeria contamination in their products throughout the production process, including transportation, storage, and all stages of production line handling. TEGAM offers a wide array of temperature probes and sensors for our RTD thermometers, thermistor thermometers, and thermocouple thermometers. View our guide to get more information on sensor types, connector types, probe tip styles, cords and handle options to use in conjunction with our digital thermometers. Do You Need An Intrinsically Safe Digital Thermometer? Which Calibration Standard Should I Get? Z540-1 or ISO 17025 Calibration? How the Times Have Changed for Thermometers and Thermocouple Calibrators! What Exactly is Cold Junction Compensation? How Does It Relate to the Use of Thermocouples as Temperature Sensors?